IT pros may find it tough to compare AWS and Azure. But we decode their free and paid plans, as well as costs, SLAs and more. AWS may show it isn't the best fit. Amazon Web Services (AWS) trumps Microsoft's cloud in some areas, but falls short in others. Here's a look at each cloud platform's free and paid options, how to compare cloud costs, and how AWS service level agreement (SLA) and support stacks up to Microsoft Azure. Public cloud free tier is a great way to get started in the cloud. Azure and AWS both ranked as leaders in the infrastructure as a service space this year by Gartner Inc., offer free options. The free tiers provide basic support and limited resources with a swipe of a credit card and a phone number. The free tiers are mostly just for testing, though some companies combine it with paid cloud services to minimize costs, said James Staten, an analyst with Forrester Research Inc., an IT analysis firm based in Cambridge, Massachusetts. Most enterprises read the SLA and immediately throw up on it, because they want to negotiate with a provider. That’s the wrong approach. AWS' free tier is a recurring monthly program with a maximum use cap. Some services, including Elastic Compute Cloud (EC2), Elastic Beanstalk (EBS) and Simple Storage Service (S3), are only allowed for 12 months. New AWS EC2 users receive 750 hours of EC2 running Linux/Unix micro instance usage, and the same number of hours of EC2 running Windows Server micro instance usage and Elastic Load Balancing, plus 15 GB data processing. The free tier also includes 30 GB of Amazon EBS Standard volume storage, plus 2 million IOs and 1 GB snapshot storage, as well as 15 GB of bandwidth out aggregated across all AWS services and 1 GB of Regional Data Transfer, according to the AWS website. The AWS free tier is discounted from customers' monthly bills and any workload charges that exceed the free tier cap are charged. With Azure's free tier, IT pros get $220 worth of cloud services to use over 30 days, and then the resources are suspended, generally enough for a small instance. Exceeding the $220 limit doesn't lead to additional charges, only suspended resources. However, those resources can be retained by customers who switch to a pay-per-use Azure subscription, according to Henrik Johansson, director of professional services for nGenx, during his session comparing Azure to AWS during the Citrix Synergy conference in May. MSDN subscribers get up to $1920 per year of additional Azure services, according to the Azure website. Microsoft also offers a broad program called BizSpark for startups that build Web apps, which provides free resources from Azure for three years. AWS Reserved Instances (EC2) choices are based on expected usage – low, medium or high. They are available in one- or three-year terms for an upfront fee, which varies widely depending on the instance type, region, term, and other factors. Longer terms and higher utilization rates lower hourly rate costs. EC2 instances allow for movement to other availability zones within regions. It is simple to deploy but requires upfront planning, Johansson said. Microsoft's Azure commitment plans are based on non-refundable monthly paid or prepaid commitments; the minimum plan is $500 per month on a pay-per-month basis. These plans apply to all types of Azure resources with the exception of cloud storage, which was removed as of April 2014. "The [removal of storage] slips the value down a bit on their commitment program,” Staten said. “It's still significantly more expansive and flexible than AWS revenue commit [plans], though." IT shops can work out discounts from between 20% to 32%, and Windows enterprise customers can probably negotiate bigger discounts as there are incentives for Microsoft's sales partners to encourage Azure use, Staten said. "The longer you commit, the bigger the reduction in your bill," he said. The Azure commitment plans are also more broadly accessible, and apply to a number of cloud services, including mobile backend and streaming, Staten said. With AWS discounts, IT pros must know the size of the instance they plan to use and how many, in aggregate, that they'll need. "If you are wrong, there isn't a clean recourse, other than selling those instances on the [Reserved Instance] Market," Staten said. "That isn't ideal for enterprises, and that's a growing pain AWS will experience as more enterprise customers use it." However, AWS also offers instance types that don't require as much upfront planning, including On-Demand Instances that let you pay for compute capacity by the hour with no long-term commitments or Spot Instances that allow you to bid on unused Amazon EC2 capacity to get rates far below standard prices. 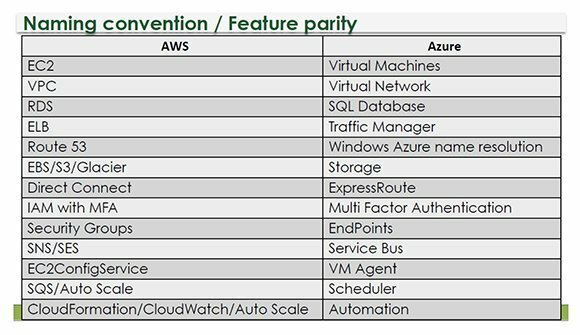 AWS and Azure use different naming conventions for the same types of features, complicating direct comparisons. Since the architectures and software designs aren’t the same, the performance is different. However, IT pros can do apples-to-apples comparisons with a known application configuration and measure it as it runs, Staten said. "People often look at [cost] from a static perspective, where they compare the cost of an application that doesn't ever change," he said. "If you have that type of app that has no elasticity, it doesn't belong in the cloud." IT pros can test workloads using each cloud providers' cost calculator tools, or a third-party tool such as RightScale's free Plan for Cloud calculator, which allows IT to see their running application costs. Today's cloud cost calculations show AWS is slightly cheaper than Azure, but costs can quickly get out of control. The biggest cost gotchas with AWS are the significant number of attractive AWS services and third-party products listed in the Amazon Marketplace, each with a per-hour cost, Staten said. There's also the issue of software license costs in the cloud, he added. "License issues won't apply if you are 100% Windows or open source,” Staten said. "But if you bring in a vendor like Oracle, and we see this with them all the time, the Oracle license can blow up your [cloud] cost model." Oracle software was included in the Azure discounted committed spend plans, but is no longer included as of July 1, 2014. While IT pros should seek out instances with the highest discount, cost per hour should not be the main factor, Johansson said during the session. Staten concurred that price shouldn't drive cloud choices. Companies should choose the platform that makes their IT staff more productive - the cloud that offers the most agility and the best app delivery, he said. Companies considering either platform must also look closely at SLAs. In the cloud, there tends to be a blanket, take-it or leave-it SLA, and enterprises are unaccustomed to that, Staten said. "Most enterprises read the SLA and immediately throw up on it, because they want to negotiate with a provider," Staten said. "That’s the wrong approach." If you arrange a unique implementation in the cloud, it's no longer multi-tenant, and you would need a unique SLA, he said. Negotiations between public cloud providers and customers often leave IT pros with more responsibilities than they'd imagined. "That's the uneven handshake of cloud consumption," Staten said. Amazon and Azure both provide a 99.5% SLA for cloud services and virtual machines. AWS S3 and Azure Storage both offer a 99.9% SLA. Amazon Route 53 comes with a 100% SLA, compared to a 99.99% SLA for Azure Traffic Manager. AWS's CloudFront and Azure CDN both come with 99.9% SLA. Microsoft has plenty of partners who can deliver the support enterprises need, but AWS has only begun to prove itself in the enterprise support arena. However, AWS is hiring professional services providers to learn how to work with enterprises, according to Staten. AWS already partners with IT consulting firms, including Capgemini, 2nd Watch and Accenture, so IT shops can call enterprise service providers when there is an issue, rather than deal with AWS directly. Third-party ecosystem support is also a big deciding factor for which cloud to use, as the ecosystem includes ISVs, channel partners, other cloud service providers and developers that support AWS and Azure. AWS has a massive ecosystem already. Most importantly, beyond third-party technology and service options, it involves IT talent. "Companies may have a couple of developers and IT staffers who know cloud, but they'll need to add more," Staten said. Because AWS' ecosystem is vast, "you'll easily find people with AWS knowledge." Microsoft could gain an advantage if it turns all of its channel partners into Azure partners, but for now, there are plenty who have yet to be trained on Azure support, and you probably don’t want to be the first customer of a partner who is newly trained, Staten said. Other cloud platform considerations include security and compliance, integration with on-premises systems and factors that depend on a company's unique needs. AWS vs Azure: Which will you choose?